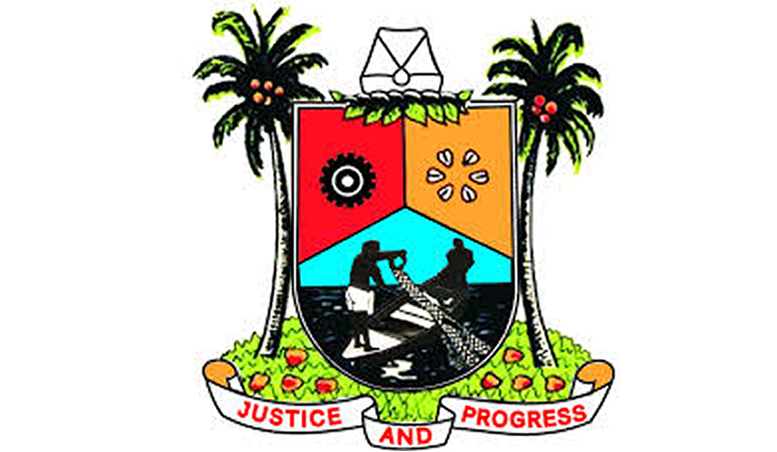 Lagos State Governor, Mr. Akinwunmi Ambode on Monday inaugurated chairman and board members of the State Teaching Service Commission (TESCOM), with a charge on the appointees to give top considerations to teachers’ welfare and ensure employment of only well qualified professionals to teach in public secondary schools in the State. Speaking at a twin event which also witnessed the swearing-in of Mrs. Adesumbo Abolarin as Permanent Secretary/Auditor General for Local Government, held at Lagos House in Alausa, Ikeja, Governor Ambode said it was important for the public officers to justify their appointment by working ultimately in the interest of the people. He said the passage and signing of the Teaching Service Commission Bill was a great moment for the education family in the State coming after eight years of several attempts, adding that the development became imperative as a result of the unrelenting efforts of the State Government to strengthen the education sector. “With the knowledge that education plays a very vital role in the development of our society and that a society cannot thrive above the level of its educational attainment, the passage and signing of this Law was very essential. “Today, in fulfillment of the provision of that law, we have just witnessed the inauguration of the Board whose responsibility will be to ensure that the objectives of the law are achieved. “For avoidance of doubts, let me state that one of the major aims of this law, which shall be a key responsibility of this Board, is to ensure improvement in the welfare of our teachers and also ensure that well qualified teachers are recruited into our public secondary schools,” Governor Ambode said. He said it was particularly instructive that seasoned educationists and administrators had been carefully selected based on their track records for appointment into the TESCOM board, expressing optimism that the State would witness rapid improvement in the education sector, particularly at the secondary level. “You will agree with me that if we are to achieve the kind standard we desire in our educational system and also lay a good foundation for the future development of our State in terms of quality manpower, we must give adequate attention to maintaining highly motivated and effective teaching personnel. “I, therefore, charge the Chairman and members of this Board to study very carefully the provisions of the law in order to fully understand their role and responsibilities expected of them. I also enjoin you all, to ensure that due process is followed in all matters that would be brought to your attention and for your decision. “You should be unbiased in the discharge of your responsibilities as a board. We have done a lot in the provision of educational infrastructure in our public schools; all of these infrastructural facilities will amount to a waste if not complemented with dedicated, well-motivated and committed teachers,” Governor Ambode admonished the appointees. The Governor also appealed to teachers to cooperate with the Board to further ensure fair play in the discharge of their responsibilities. While the Chairman of the Board is Mrs Olabisi Ariyo, others members are Mr. Jacob Ashaka, Mrs Sidikat Smith, Mr Adeleke Oluseun Kara and Mrs Adijat Kuburat Hassan. Responding on behalf of the appointees, Ariyo thanked Governor Ambode for the confidence reposed in them, and assured that the board would work hard, be unbiased and prioritize the welfare of teachers, as well as train and retrain them for optimal performance. 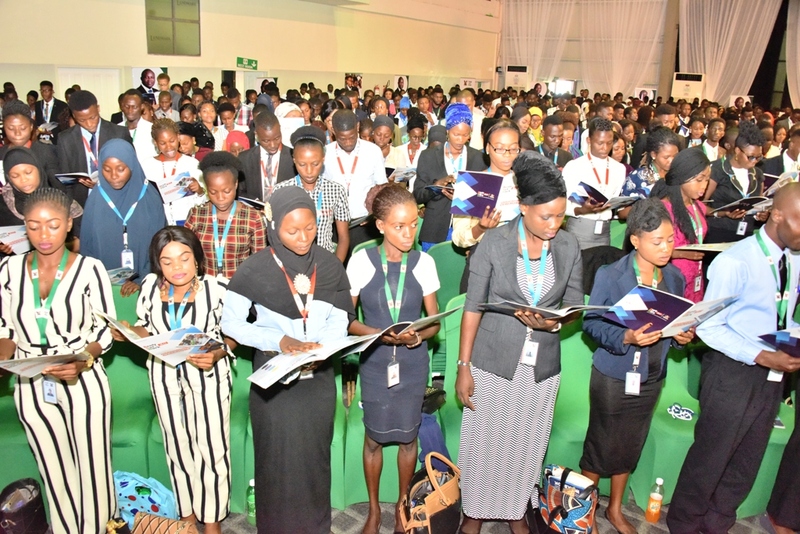 Cross section of graduating students of Ready Set Work 3.0 during their graduation ceremony at Landmark Event Centre, Victoria Island, on Tuesday, October 30, 2018. It gives me great pleasure to stand here as we graduate the third batch of Ready-Set-Work Scholars. Congratulations to the Ready-Set-Work Class of 2018. Three years ago, I stood on this same spot and looked across a room of about 500 Ready-Set-Work Scholars, 52 volunteer facilitators, friends and partners of Ready-Set-Work – many of whom are in the room today. At the time, Ready-Set-Work was a newly-birthed idea, and a deliberate endeavour on the part of this administration to ensure that any student who graduated from a tertiary institution in our State possesses all the requisite skills, knowledge, tools, as well as the right mindset to contribute to theLabour Market; whether as a value-adding employee or a job creator. Ladies and Gentlemen, I am pleased to inform you that over the past three years, we have stayed true to this vision and scaled up our impact. I invite you to take a look across the auditorium today to see how that small spark in 2016 has become a roaring fire. From 500 Ready-Set-Work Scholars in 2016, we are celebrating today the impact of this program on the lives of over 37,000 students who have participated in the Ready-Set-Work program over the last three years, either through the RSW On-Campus Training or through the RSW Online Academy. We have taken it a step further by supporting top performing students by providing paid internship opportunities, as well as seed funding and incubation for viable business ideas. To date, over 1,200 RSW Scholars have benefited from internship placements, and another 2,000Scholars from the 2018 graduating class will also be placed in internships. 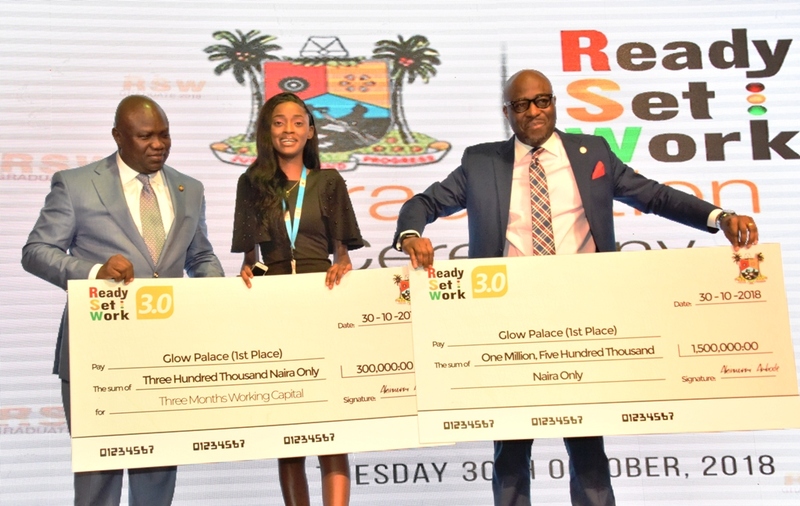 I am reliably informed that the first place winners of the 2016 Ready-Set-Work Business Pitch Competition are, with seed funding and incubation support, now on track to producing up to 10,000 liters of biogas daily within a community in Ikorodu, with zero carbon emission. Other ReadySetWork graduates are adding value and making us proud as employee’s top companies and countless small businesses across the State. We thank our network of over 1,000 employers who, through the years, have contributed to preparing RSW Scholars for the world of work, by providing internship opportunities in their organizations. Some of our partner organizations have taken on the cost of paying their interns, but Lagos State has also had the privilege of supporting small and medium size businesses by paying the stipends for their interns over a period of 3 – 6 months. In marking another successful edition of Ready-Set-Work, we cannot overemphasize the important role of our Volunteer Facilitators, the largest volunteer faculty in Nigeria. These selfless individuals gave up their Saturdays, traveled from far distances, committed to multiple hours of preparation, and made other sacrifices for 13 weeks to invest in our students. My remarks will not be complete without special thanks to heads of tertiary institutions for collaborating to ensure the success of this program. 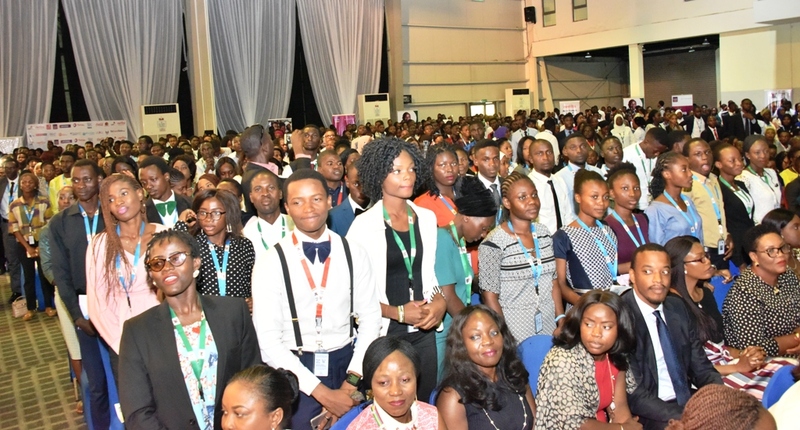 Our host institutions this year – Lagos State University, Lagos State Polytechnic and the University of Lagos – all went the extra mile to provide adequate facilities for the duration of the program. I thank our corporate partners and sponsors again for their commitment, financial contributions, and technical support. We trust that we can count onyou to continue investing in the future of Lagos State. Ladies and gentlemen, as the world awakens to the realization that investment in human capital is critical to the success of any nation, we in Lagos are happy to celebrate today, three years of consistent investment in our people, as we present to you the Ready-Set-Work Class of 2018. By investing in people, we will secure the future prosperity of Lagos State and Nigeria. Withprogrammes like Ready-Set-Work, Code Lagos and the Employment Trust Fund we are providing platforms that will nurture a society of problem solvers, change-makers, and value adding citizens helping to improve our economy. These innovative programmes must therefore, not be allowed to die. Finally, to the RSW 2018 Graduating Class, I say go out there and transform our nation. We are proud of you. 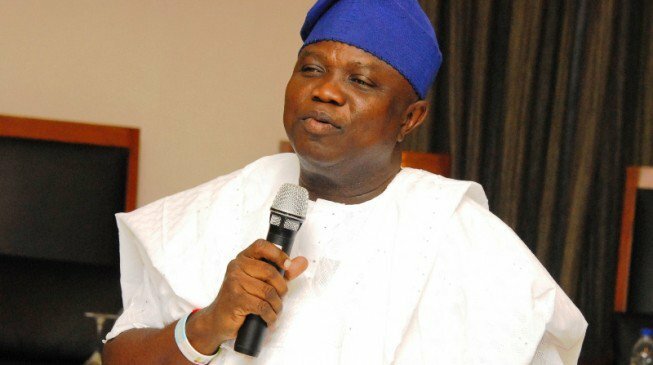 Wife of the governor of Lagos State, Bolanle Ambode, has again reminded nursing mothers and pregnant women the importance of exclusive breast-feeding of newborn babies. She disclosed this during a telephone interview on the occasion of this year’s World Breast-feeding Week, held in the first week of August every year. Bolanle noted that the benefits of breast milk to the infant were too profound to be ignored, as it was an important foundation for a baby’s life, capable of determing whether the baby would live or otherwise. She said putting a baby to the breast in the first hour of life was a major safeguard against infant’s death, adding that exclusive breast-feeding for the first six months, help them to grow, prevents under nutrition, promotes brain development while reducing the risk of overweight. She said further that breast milk was vital because it acts as the baby’s first vaccine, boosting its immunity. According to her, “Nothing can compare to the breast milk, no matter the nutritional value of the baby formula, it cannot adequately take the place of breast milk in the life of the new born”. “God who created it in His own special way to be baby-friendly, has made it the most important and most beneficial type of food a baby gets to know. Nursing mothers should not make excuses of their jobs or career for not doing exclusive breastfeeding because the advantages to the baby are too many”, she submitted. The governor’s wife commended the theme for this year: “Breastfeeding: Foundation for Life”, describing it as the basic truth about the practice.